An Illumination Of Blessings: New Review! The aroma of fresh poultry wafted towards me as I entered the butcher shop on my annual Thanksgiving pilgrimage to secure a choice turkey. Holding my nose against this odiferous chore, As I navigated through the crowd towards the service counter, I heard a shrill squawk as I slipped on something squishy buried beneath the sawdust-covered floor, colliding with a strange, dark figure. Recovering her composure, the elderly patron scowled and pointed a bejeweled, wrinkled finger at me. I shrugged and apologized but barely suppressed a grin. With her beakish nose and trembling, wattled chins, she looked like a tough old turkey in human disguise. Outlandishly clad in a turban-wrapped fez, an iridescent feathered cape over an embroidered vest and paisley knickers, her dignified bearing was mysteriously intimidating. I expected she would berate me for my rude, if accidental move, but instead, looked me up and down with contempt and turned dramatically back towards the counter, muttering to herself with a vaguely Middle Eastern accent. “How weird was that?” I mumbled sub-vocally, reaching for a double-digit service number. My wait would be longer than I thought since several ‘pilgrims’ were ahead of me, including the ‘turkey lady’. When I took my place in line, I found my artist’s eye drawn to her burgundy velvet fez with it’s gently swinging silk tassel. Idly, wondering whether turkeys might really be from Turkey, I remembered a fanciful notion described by some sixteenth century English naturalists. It seems they imagined a resemblance between the turkey’s red head adornments and the fez, a tasseled cap worn at the time by Turkish men as a national headdress! Stirring the sawdust around with my shoe, I began to recall other bits of turkey trivia. Actually, turkeys pre-date humanity by about 10 million years, having roamed throughout Africa and most of the Americas. However, history records that an exotic bird with a featherless head and white-speckled feathers on its rounded body was imported from the Guinea coast of Africa into Europe during the Turkish invasion early in the sixteenth century. This creature was later classified as a guinea fowl. Along with other strange products, such as coffee, a chewy confection called ‘loukoum’ and beautifully patterned textiles and carpets, the English dubbed anything that had never before been seen in the west as ‘Turkish’, including the ‘Turkie-bird’. The line to the service counter finally started to move and the ‘turkey-lady’ waddled up to claim her order. Before depositing her payment on the counter, she opened her package to inspect its contents and immediately began to haggle with the butcher’s assistant. Flustered, he stared at her, then ran off to fetch his boss. The portly, ruddy-faced butcher emerged from the back room, wiping his bloody hands on his apron and glowered at his bizarre customer. “What do you mean, haggling with my prices? !” he roared. “My turkeys are the finest in town and worth every penny I ask! Furthermore,” he continued craftily, “my turkeys are so delicious, your guests will praise you to the heavens, swearing that you got twice the bird you bargained for!” Appearing to consider this, the ‘turkey lady’ suddenly assumed a mask of complete charm and proceeded to defend her point of view. “My dear Mr. Hogg,” she murmured, “I can see that you are very busy today, but if you would be so kind as to hear my little Turkish tale, then perhaps you will understand.” Intrigued, I joined the other customers as they moved closer to listen. Watching the other customers whispering among themselves, I thought, “Wow, that was impressive; could that hodja have been her ancestor?” Without waiting for an answer from Mr. Hogg, the old bird winked at me and secured her feather cape. Then, she gathered up her parcel and swept out of the shop, yellow sawdust rising in her trail. The Turkey’s Tale was first published in 1993 as the Thanksgiving folktale feature in the Focus Magazine of The Pittsburgh Tribune-Review. It is one of my Visual Fiction stories published in the T-R between 1993-97. Although Jewish tradition has no direct cultural association with Hallowe’en, there are plenty of spooky and sometimes funny tales to make your hair stand on end and foster a wee suspicion about the existence of demons. Like this one, called The Bride’s Finger. 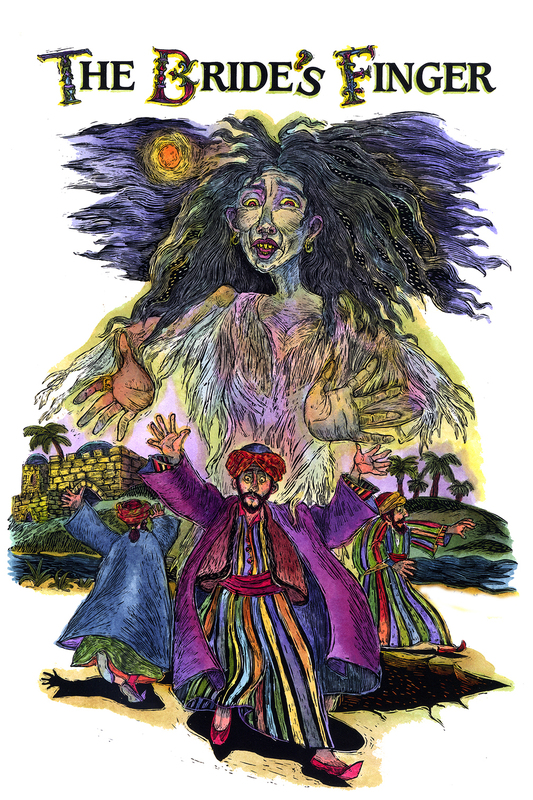 I adapted it from a sixteenth century Palestinian folktale* for my Visual Fiction series of stories, published between 1993-1997 in Focus Magazine, which was then a Sunday supplement in The Pittsburgh Tribune-Review. The bright orange moon illuminated three young men as they walked in the forest surrounding the city of Safed in ancient Israel. Raphael, the oldest, was being teased by his friends, for this was the eve of his wedding. Raphael considered himself a fortunate fellow because Shira, the woman to whom he was promised, was the clever, beautiful daughter of the city’s wealthiest merchant. Soon, they reached the edge of a river and sat down to rest. Their spirits were so high that at first, no one noticed the strange object protruding from the earth at their feet. Then, Tobias, the youngest man, grew quiet and leaned over to examine it, assuming that it was some sort of root. Pointing at the object, he nudged his friends, “Raphi, Gideon; doesn’t this thing look like a finger?” he whispered. Still laughing, Raphael and Gideon teased their friend. “Sure, Tobi, it’s telling you to watch your step!” Tobias shrugged, then smiled slyly at Raphael. “Just like your clever bride will make you watch your step? Not to be outdone, Raphael announced smugly, ” I will put a ring on that ‘finger’ just to show it who’s the master around here!” He took off his ring and slipped it ceremoniously onto the protruding object. Suddenly, the ‘finger’ began to emit an eerie, greenish glow, twitching and wriggling convulsively. The three young men jumped back, gasping in amazement, as the earth shuddered beneath them. Frozen in shock, they gazed horrified at the black chasm which opened at their feet. The greenish glow surrounding the ‘finger’ expanded at once, revealing a woman’s form wrapped in a ragged shroud, rising up out of the abyss! Her arms opened as if to embrace a lover. “MY BRIDEGROOM!” she shrieked in a terrible voice staring straight at Raphael with lifeless eyes. Recovering their wits, the three friends screamed hysterically and ran for their lives, pursued relentlessly by her unearthly wailing. When they managed to reach their homes, they bolted every door and window, shuddering with relief at their narrow escape. In the morning, still trembling with fear, the young men met at Raphael’s house to discuss the consequences of their irreverent behavior. Deeply ashamed, they vowed to keep their horrible adventure a secret. Then, they parted soberly for Raphael’s ‘real’ wedding. That evening, a delicious aroma of exotic foods accompanied the sounds of merriment and music flowing from the palatial home of the bride’s family. Many distinguished guests had gathered to witness this wedding that would unite the two wealthiest and most influential families in Safed. Suddenly, as the rabbi cleared his throat to begin the ceremony, a spine-tingling shriek issued from the marbled entrance. Screams of panic followed as the crowd rushed madly for the doors, leaving only the rabbi, the bride and groom and their immediate families gaping in horror at the apparition, who was clad only in her vermin-infested shroud. The rabbi was the first to regain his composure. Shrewdly, he appraised the corpse, taking in her filthy, waist-length hair and curving, claw-like toenails. Then, he pointed accusingly at her. “Why have you left your grave and come to befoul our joyous celebration?” he thundered. With a moan that was terrifying and desperate at once, the corpse pointed at Raphael and Shira, his bride-to-be, who cowered behind the rabbi. “I have come to claim what is mine!” she announced shrilly. “Why do you allow him to marry another when he is betrothed to ME?” She raised her hand to display the finger on which Raphael had foolishly placed his ring. Wide-eyed in amazement, the rabbi turned to Raphael. “Is this true?” he demanded. Panic-stricken, the groom revealed the tale of the previous evening. With a worried expression, the rabbi pulled at his beard and asked the groom if he had pledged the sacred vow three times before two witnesses. Raphael nodded fearfully. “Well, my son,” said the rabbi, shaking his head. “I am afraid that a rabbinical court must be gathered to resolve this, for according to our laws, a promise is a promise, and it looks as though ‘she’ is your wife!” Raphael’s eyes rolled up out of sight as he slid to the floor in a faint. Shira clutched her veil, sobbing uncontrollably. Their families stood by helplessly, begging the rabbi to release their children from the awful curse. For days afterward, Safed buzzed with excitement over the ‘marriage of the living and the dead’. No one had ever heard of such a phenomena! Meanwhile, the rabbi searched feverishly for legal precedents to this case, but soon concluded that one would have to be set. He then sent for three renowned rabbis, requesting their presence at the rabbinical court that would convene three days later. The people of Safed crowded the hall of the court. When all were seated, the Safed rabbi summoned the dead ‘bride’ to appear. Placing her under oath, he instructed her to recount the events in the forest and to swear that Raphael had indeed ‘married’ her. The hall became very still, as the rabbis mulled over this statement. After a few moments, they decided to ignore her statement and continue the proceedings because the arcane interpretations her statement provoked would confuse the issue at hand. So they called on the parents of the bride and groom, placed them under oath and requested them to verify that their children had long been pledged to each other. Almost in unison, the fathers spoke, stating that their pledge was formed even before the birth of their children! When all the witnesses had spoken, the rabbis retreated to a private chamber to make their decision. Raphael shivered in fear, casting sideways glances at his ghastly ‘wife’. She fluttered her eyelashes and bared snaggled yellow teeth in a horrific attempt to smile at him. Soon the rabbis filed back into the court. The Safed rabbi was the first to speak. “According to our Laws, it is indeed true that Raphael made a valid vow of marriage in the presence of Gideon and Tobias, his two witnesses.” He paused for a moment and the large hall grew thick with terror. “However,” he continued, “we cannot deny that this wedding vow would invalidate his former betrothal, since the Law states that one vow may not contradict a prior one. Also, we have considered the bridegroom’s statement that his ‘vows’ were not intentional. And finally, as there is no precedent for a union between the living and the dead, these vows are not acceptable; for the ‘bride’ is obviously dead. Therefore, we declare this ‘marriage’ annulled!” At these words, Raphael grew weak with relief as applause erupted among the living. But Rachel Bat Shimon, knowing she was defeated, released a shriek as bloodcurdling as it was pitiful. She then fell onto the floor and embraced death once again. Those present truly felt her loss and indeed, the rabbi ordered that Rachel be buried again properly, so that this tragedy would not recur. At last, the rabbi of Safed gathered the bride, the groom and their families together to perform the true wedding. The distinguished guests, recovered from their shock and returned to witness the joyful ceremony. One one guest was missing: Death. Note: For those who have followed my illustrated posts here, you might notice a marked difference in the drawing style of The Bride’s Finger and in Moving The Immoveable Feast published a few months ago. These were executed in sumi ink on scraperboard (scratchboard) and hand-colored with watercolor. No digital enhancements, whatsoever. Other drawings in the Visual Fiction series were done in a variety of art styles that in retrospect allowed me to understand the trajectory of my artistic development. As an illustrator, it’s sometimes instructive to look back not only to see where I’ve been, but where my Muse might decide to take me next! Two Days Remaining To Fund This Unique Sweatshirt Design! For much of my life until the beginning of my professional career, I had identified as a (‘fine’) artist, but invariably received rejection comments for my work (particularly from exhibition jurors and gallerists) like, ‘Your work is good but it’s too illustrative.’ What!? Illustrative of what? Did these ‘experts’ imply that my work was unacceptable because it told a story, provoked ideas, questions or emotions? Isn’t that what good art should do? Nevertheless, I knew I had something unique to offer. Inspired by a long list of historic and contemporary illustration luminaries from Rembrandt, Albrecht Dürer and William Blake to Edmund Dulac, Arthur Rackham, Moebius and Andy Warhol whose surviving original work is ironically now considered highly collectible, I defiantly re-branded myself as an illustrator. Joining ranks with illustration’s many brilliant practitioners, I embarked on a career full of risks and rewards that also offered priceless social and cultural experiences. By embracing the changing technology along the way, I learned how my work could grow in scope and impact and have rarely looked back. This design, built from my original alphabet, Garrulous Gothic (©2015 Ilene Winn-Lederer) was inspired by the notion that brilliant illustration can be as fine an art-form as any of the ‘fine art’ that draws wealthy collectors to glitzy events like Art Basel, Art Miami, etc. It’s high time for a new Golden Age of Illustration! I’ve posted it on a site called Threadless.com based in Chicago which has operated since 2000 with an interesting business model that is somewhat similar to other online crowd-funding platforms like Kickstarter. Once a design is accepted by Threadless, an artist has ten days to promote it. If enough votes and funding commitments for a design have been posted, my ‘Illustration’ sweatshirt will be produced and sent to anyone who has ‘backed’ it. Threadless doesn’t charge your card unless a design is fully funded. Today, on Mother’s Day, I remember mine with fondness and one of the many bits of wisdom she imparted to me in my artistic endeavors which I paraphrase here: When you undertake a task, do it with all you’ve got and whatever the outcome, don’t be discouraged; every perceived roadblock only means you are facing a door that will lead you somewhere new and unexpected. So, having received my official sign-off note from Kickstarter, it is with a mix of sadness and relief colored with hope that this will be the final update for this project before we move on to its next phase. Although I didn’t reach my stated goal at Kickstarter, I don’t intend this to be the end of the road for Notes From London: Above & Below. But first, here is something I’d like to share with you. The Kickstarter experience is both exciting and terrifying. Exciting for the opportunity to learn the new skills necessary to present and promote a project like this, yet terrifying for someone like me who, for the most part, thrives in the comfort zone of my studio and quakes at the idea of putting myself out there in the meleé of thousands of projects all vying for financial support. When anxiety comes to sit on my shoulder like some hyperactive raven, I find myself thinking “What if nobody likes this?” or “What if I work really hard but still don’t make it?” At times, it’s almost enough to put the kibosh on the whole thing. Yet, that saner, optimistic part of me usually comes to the rescue reminding me that I walked into this knowing that despite all my hard work, failure is always a possibility but not necessarily an option. That said, I want to thank all of you who pledged your support this time around. Knowing that you all appreciate my work and understand my dedication to crafting unique content and high quality art and books makes it easy to carry on from this point. Each copy is on offer for US$30 + shipping worldwide. If you have any questions, please contact me at: ilene@winnlederer.com. Again, I thank you for your confidence in my work and I’m looking forward to sharing Notes From London: Above & Below with all of you! Update #5: Notes From London: Above & Below: Miracle? If material miracles are possible, then this campaign for Notes From London: Above & Below,at 5 days left to go and funded at just 22% of its 3,000 goal will certainly need one- if it is to become a book you can hold and enjoy for years to come. And If you are a latecomer to this campaign, then by all means, do visit this link and lend your support! As a professional writer and illustrator, I am also a realist who agrees with Israel’s former Prime Minister David Ben Gurion when he said, “...in order to be a realist you must believe in miracles”. I say this because many strange things have happened both over my personal life and career; unexpected meetings that led to connections with people that led to certain important tasks and outcomes that I’ve only come to understand in retrospect. While it’s not quite over, the trajectory of this project is one of them. And I feel certain that it will become a stepping stone to an event or project yet to find me. That said, Albert Einstein provided the perfect segué to Mr. Ben Gurion’s comment: “There are two ways to live: you can live as if nothing is a miracle; or you can live as if everything is a miracle”. And the latter is exactly what I plan to do, since hope is the essential catalyst in all human endeavor. FROM THE MOMENT IN CREATION when G-d ‘breathed’ the soul of life into Adam’s nostrils, we were made to understand how noses and souls are gateways to experiencing our existence. Shortly thereafter, Adam and Eve were instructed concerning the source of their nourishment: “Of every tree of the garden you may freely eat. But of the Tree of Knowledge of good and evil you shall not eat of it, for on the day that you eat thereof, you shall surely die” (Genesis 2:16-17). Overcome by their curiosity, they disobeyed, giving birth to the history of religion and its consequences. Oddly enough, scholars and rabbis reasoned, the first couple were not punished merely for eating forbidden fruit, but for the way in which they ate it; without the intention of holiness, without gratitude for its Source. How does one define gratitude? In its simplest form, a ‘thank you’ suffices for most occasions, but doesn’t really do justice to the more deeply felt emotions when you are on the receiving end of altruistic largesse whether it be a kind word, service or unexpected material gift. That is where blessings allow us to be more creative in expressing those emotions, not just to our fellow humans, but to the One whom we credit as the Source of such gifts. When it comes to food, which is undeniably physical, a blessing does more than address what we are about to consume. Yes, we eat to strengthen our bodies to healthfully house our souls, but each time we eat, we also recognize our senses of sight, taste and smell which connect our physical and spiritual essences. Judaism offers many opportunities to spiritually acknowledge all the wondrous elements of life on this planet, yet sometimes when the object of our gratitude does not fit clearly into a category specified by one of the many existing blessings, say for particular foods that we enjoy, there is the Shehakol or ‘everything’ blessing for those singular forms of nourishment. It is recited before eating or drinking any foods other than ‘fruits’ of the earth or trees, wine, or breads. The types of foods included under the Shehakol rubric are: meat, chicken, fish, cheese, mushrooms, wild herbs, some edible flowers, eggs and soy-based products. Drinks include: water, fruit juice, fruit smoothies, tea, cocoa and coffee. This blessing also covers some ‘manufactured’ foods or those prepared with a combined ingredients such as soups, candy, ice cream, peanut butter or baked desserts like apple pie; however, the ingredients used for these combined foods should not be recognizable within the product in their original form to qualify for the Shehakol. If they are still recognizable after cooking or processing, they would require individual blessings such as the ones recited for fruit of the trees or the earth. Much specific information on this blessing and the rules for its application may be found online*, in contemporary publications and in classic texts such as the Mishnah Brurah and the Shulchan Aruch*, but for this book, I’ve illuminated the Shehakol (#36 out of 36!) for An Illumination Of Blessings! as just an appetizer so to speak, to provoke your curiosity and learning. PLEASE NOTE: When you visit my Kickstarter page you will see that the top reward level of your $500 contribution towards this project entitles you to have your name included on my Dedication page! This offer will stand until August 15, 2014 when I hope to have the book ready to go to press! You may contact me with your offer at: ilene@winnlederer.com. ** The Mishnah Berurah or Clarified Teaching (by Polish Rabbi Yisrael Meir Kagan (1838-1933) is a commentary on the first section of the Shulchan Aruch or The Set Table (Yosef Caro-Venice,1563)-which addresses the laws of prayer, synagogue, Shabbat and holidays . continue to influence my illustrations for this current Kickstarter-funded project. the Creator by virtue of the unusual creatures that inhabit our world and can be recited upon seeing a rare or unusual animal. the Talmud (Berakhot 58b) and Shulchan Aruch (225:8) which offered some parameters for interpretation. strange and extraordinary forms of animal and human life that are not conventionally beautiful. The other blessing is recited upon seeing exceptionally beautiful people or animals and praises the Creator for placing such beauty in the world. 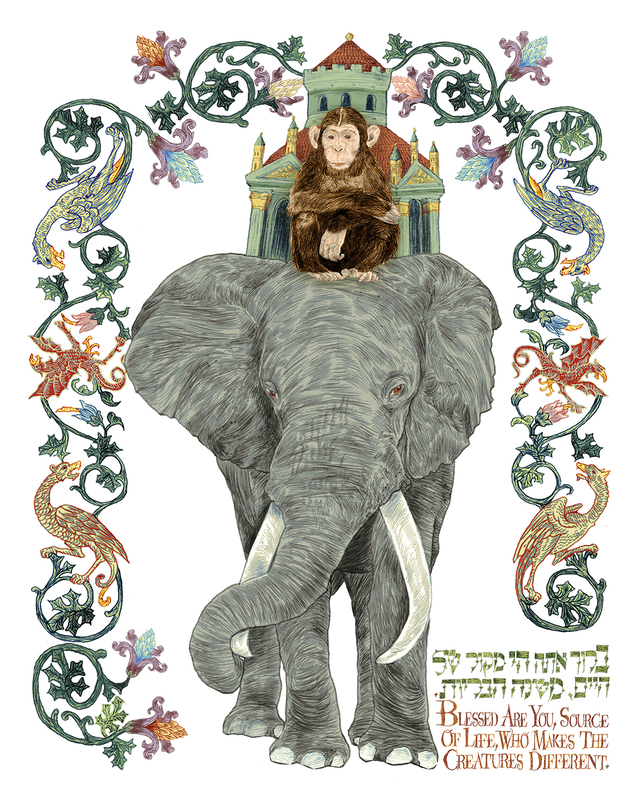 A commentary in the Gemara* specifies that the first blessing refers to the sighting of a monkey or an elephant. One rather strange explanation is offered; that humans were transmogrified into elephants and monkeys as punishment for their participation in the Tower of Babel débacle! Is this anti-evolutionary tale not a great plot for a horror flick? An idea with greater appeal to me was that monkeys and elephants are considered to resemble humans; the monkey for its body shape and manual dexterity and the elephant for its smooth, hairless skin and a trunk which it uses as though it were a hand. While monkeys and elephants are common sights today at any zoo, in medieval times they were considered exotic and rare, inspiring the creation of special blessings. Since travel to foreign lands beyond Europe was undertaken primarily by nobility and merchants, these creatures were often represented in manuscripts by illustrations that interpreted word-of-mouth descriptions by such travelers. Complicating the medieval artist’s task was the Second Commandment prohibition against creating ‘graven images’. However, because creativity is in itself a force of nature, these artists were not discouraged and gave free rein to their imaginations as they incorporated fantastical beasts and homunculi into their manuscripts. After reading this enlightening chapter, I began to wonder why elephants were often shown saddled with ‘howdahs’ that sometimes resembled castle towers. Further reading revealed that the word ‘howdah’ is from the Hindi and Arabic languages referring to portable shelters used for travel but also for hunting and military battles. Carvings of elephants wearing howdahs are often seen as pieces in chess, the symbolic game of war. *** Taking this idea a step further, I imagined that a howdah could also represent a sort of portable synagogue; an ideological ‘castle’ as its own metaphor of Jewish history. whose timeless work continues to inspire my own. Dear Backers: The Blessing For Rare and Extraordinary Animals is the 32nd of 36 blessings to be completed for An Illumination Of Blessings! We’re almost there! 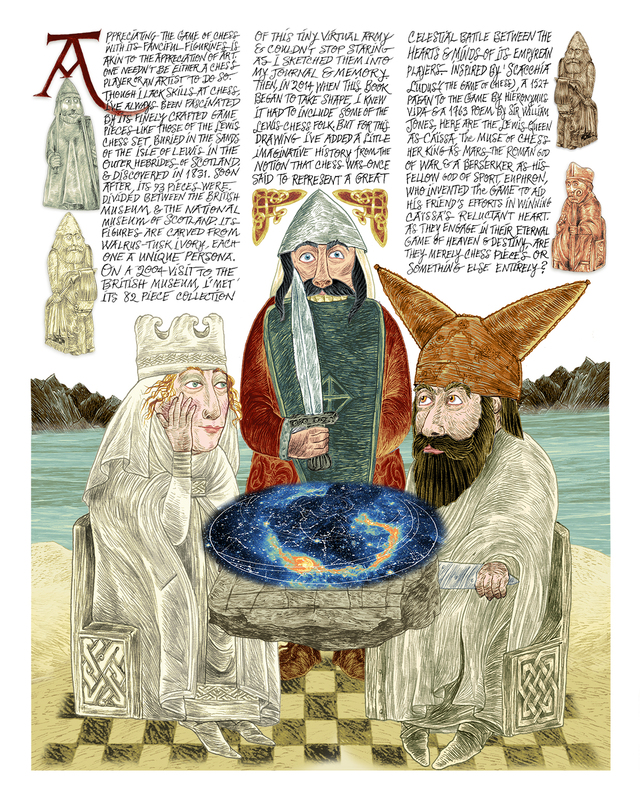 Please Note: Even if you are not a backer on this Kickstarter-funded project, you may still pre-order your copy (ies) of An Illumination Of Blessings and/or prints from its illustrations here: http://winnlederer.com/blessings/index.htm Also, if you visit my Kickstarter page at: http://www.kickstarter.com/projects/1330347473/an-illumination-of-blessings you will see that your contribution of $500 to the top reward level of this project entitles you to have your name included on my Dedication page! This offer will stand until July 15, 2014 when I hope to have the book ready to go to press! You may contact me with your offer at: ilene@winnlederer.com. ***I remembered seeing this image as a sculpture in London near the Elephant & Castle Underground station. Although orbiting satellites send us spectacular images of the clouded Earth amidst its swirling seas, these views pale in comparison to our physical comprehension of their vastness and power from our perspective of dry land or from the decks of our ships that carry us over them. As we marvel at the unknown depths from where some pre-conscious form of us emerged, the magnitude of the sea speaks to the essence of what we are. The sea, if you will, is the soul of Creation. Observing that the Earth’s waters dance on its tectonic armature in time to the moon’s allure and the mercurial winds has provoked the fear and wonder inspiring the religions and myths of many cultures whose livelihoods depend on the seas. Prayers for the safety of their fishermen, travelers and for the lands on which they live are central to these systems. 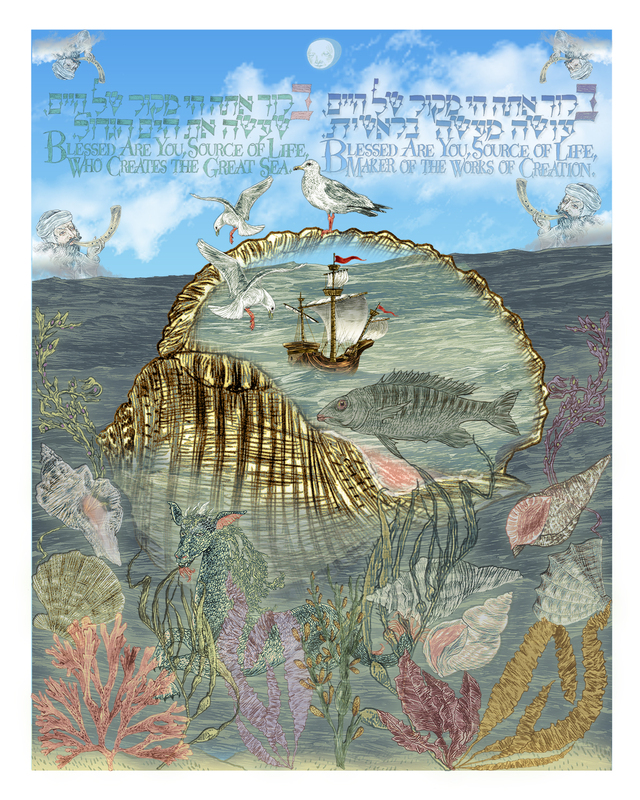 Where these prayers were once directed at individual deities deemed to control our planet’s natural forces, in Judaism, such prayers are enhanced by the Birkat Ha-Yam, a special two-part blessing for the seas and oceans. Since I have lived mostly in Mid-Atlantic cities and experienced the oceans rarely except through my travels, it is very special to me. One part acknowledges Creation as it addresses the large-scale wonders of nature while the other is directed at a specific large body of water that must have existed since the six days of Creation and must not be land-locked. It seems that no one has ever agreed upon which ocean fits this description, but according to certain rabbis* the Birkat Ha-Yam blessing was intended for the Mediterranean Sea, most likely the largest one in their own experience. Unlike those prayers that are entreaties for divine mercy and protection from the elements, the verses of the Birkat Ha-Yam are statements that acknowledge our humility in the face of our Creator and our wonder at the constancy of Creation. When I began to work on this blessing, I thought that a prosaic rendering of a seascape would suffice. But I soon learned that I wouldn’t get away that easily. Given our ancient and complex relationship with our aquatic ecosystem, the Birkat Ha-Yam begged for a more nuanced visual narrative. The image that immediately came to mind was a detail from one that I’d created for Parashat Eikev (Book of Numbers/Devarim) in my previous book, Between Heaven & Earth: An Illuminated Torah Commentary (Pomegranate, 2009). It showed a grandfather and granddaughter listening to the still, small voices in their hearts through the metaphor of a conch seashell. I chose this metaphor to express the subtlety of such an experience because I have a similar shell in my collection of oddities and have always imagined the sound of the seas echoing from its inner spirals. So a large conch shell became the centerpiece of my illustration, open to reveal the ‘heart of the sea’. Within the conch is a tiny 15th century Spanish caravel sailing perhaps on a trade mission for its merchant owner. With a nod to the Biblical Leviathan, the piscine creature swims lazily in wait for the time of Messiah. Below, the conch’s compatriots nestle among a watery scape of seaweeds. In the morning sky above, a faint moon observes the four winds competing to guide the ship to its destination as the seagulls survey their boundless territory. At last, even when I thought the illustration was nearly done, I still couldn’t resist playing with one last image; do you see the fanciful little beast** hiding among the sea wrack? Dear Backers: The Birkat Ha-Yam is the 31st of 36 blessings to be completed for An Illumination Of Blessings! We’re almost there! * In the Shulchan Aruch 228:1(The Code Of Jewish Law) compiled in 15th century Safed by Rabbi Yosef Karo. ** Hippokampus (from the Greek for horse (hippo) and sea monster (kampus), named for its resemblance to a seahorse. Science and religion have always been strange bedfellows, each occupying neighboring compartments in our minds, yet ever distrustful of each other. Nevertheless, they remain eternal antagonists, each perhaps seeking an impossible validation from the other. This observation is far from new, but it came to me as I considered how to approach this blessing for the moon, an ancient source of wonder until July of 1969, when American astronauts walked on the moon. They became at once part of its history and its future in human perception. Although they seemed to prove that the moon was physically no more than a rather large, cratered and lifeless asteroid, unworthy of the age-old mysteries attributed to it, still, they changed little for most of us earth-bound creatures in terms of our romantic, spiritual or prophetic predilections. We still love to invest the moon with human qualities in our arts and culture or laugh at the idea that it is made of green cheese. Yet, whether we are romantic or pragmatic, we can safely admit there is a certain subtle beauty in the presence of the moon; it’s there to light our paths at night and in a numinous way, to remind us that we are not alone or without purpose in the dark. This practice directly conflicted with Egypt’s officially sanctioned sun worship. It also ensured that the moon would not become an object of worship; instead, its cycles became the basis of the Jewish calendar, a valuable tool for timekeeping and agricultural foresight. In this system, each month defines one lunar cycle as the moon completes one orbit of earth. One hallmark of the lunar calendar, the Rosh Hodesh* holiday is observed with prayers and blessings at the point in the moon’s orbit when it is suspended directly between earth and the sun so that a thin crescent of it is visible to all, marking the beginning of a new month and/or season. Metaphorically, the appearance of the moon as it progresses through its phases, illustrates our ‘deliverance’ from spiritual darkness to light. It would seem that such ‘enlightenment’ included recognizing the importance of women in early Israelite culture, yet I wonder, does it also tell us that the story of human existence would always be written in alternating chapters of darkness and light? It is interesting to note that the monthly cycles of both women and the moon figured in the establishment of Rosh Hodesh as a holiday. Perhaps this reflects the idea that both women and the moon are capable of rebirth or renewal and must be honored as such. But two references in the Babylonian Talmud perceive it as a special one for women in particular while an 8th century midrash provides the backstory. The first reference, in Tractate Megillah (22b) states that women must be exempt from work** on this day. The midrash, Pirke De Rabbi Eliezer*** suggests that after the incident of the Golden Calf, women were given a work-free holy day as a reward for their refusal to contribute their jewelry to the construction of the idol. Later, the French medieval Torah commentator Rashi (Rabbi Shlomo Yitzchaki) specified that the exempt work included spinning, weaving and sewing since these were the skills that women freely contributed to the construction of the Tabernacle (Mishkan) following the Exodus from Egypt. The second reference points to a related monthly prayer called Kiddush Levanah****, or The Sanctification of the Moon in which we express our appreciation for G-d’s celestial gifts. It is traditionally performed outdoors in the moonlight (preferably under a cloudless sky) at the end of the Sabbath from 3-7 days after the new moon is visible. So, in Sanhedrin (42a) Rabbi Yochanan teaches that one who blesses the new moon in its proper time is regarded as one who greets the Shechinah (female aspect of the Divine Presence). Although Rosh Hodesh celebrations have an ancient history, it wasn’t until the early 1970’s that such celebrations became popular. They were one of the ways in which Jewish women could explore and express their own spirituality while enhancing their communal roles. These events gave birth to support groups for various lifecycle issues and forums for women’s studies. 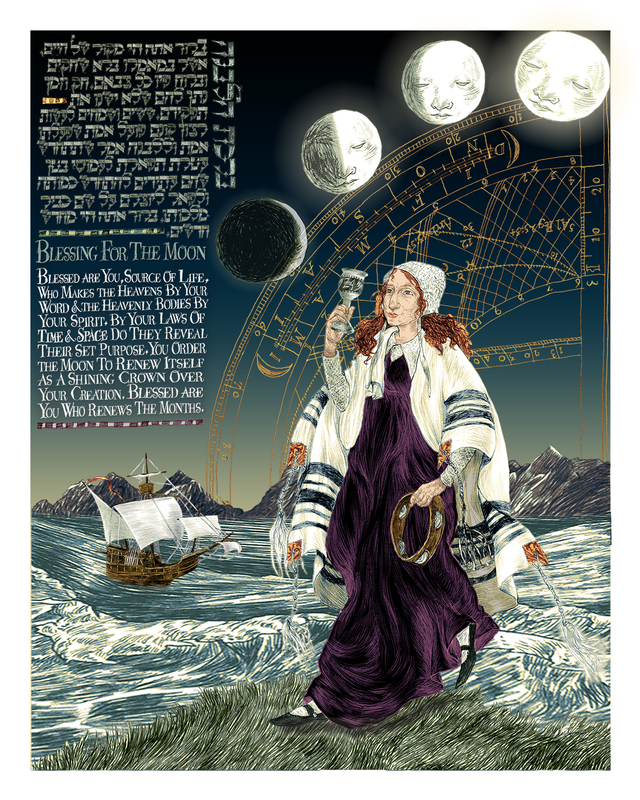 In my illustration for The Blessing of the Moon, I have visually addressed both the Rosh Hodesh and Kiddush Levanah rituals. The sun has just set beyond the distant mountains and on a hillside above the sea. A woman wearing a tallit, or prayer shawl is dancing to the rhythm of her tambourine as she raises a cup of water in tribute to Moses’ sister Miriam and to all women among the Israelites who crossed the Red (Reed) Sea after the Exodus from Egypt. It was the first performance of a song-prayer, Shirat HaYam (Song Of The Sea) that is now part of the morning prayer services worldwide. The letterforms on the cup spell ‘Miriam’ in paleo-Hebrew, an early form of modern Hebrew. I’ve shown four phases of the moon as it turns from new to full, from darkness to light, tracing its path along the ethereal form of a nocturnal quadrant, used in medieval times for astronomical navigation, perhaps on a ship like the caravel that is arriving with the tide. The ship and quadrant represent the human curiosity and ingenuity at the core of both science and religion while the woman on the hill knows deep within that love, peace and gratitude will mitigate their conflict if only we pay attention to the gifts we have been given.